You are here: Home / What a Parade! 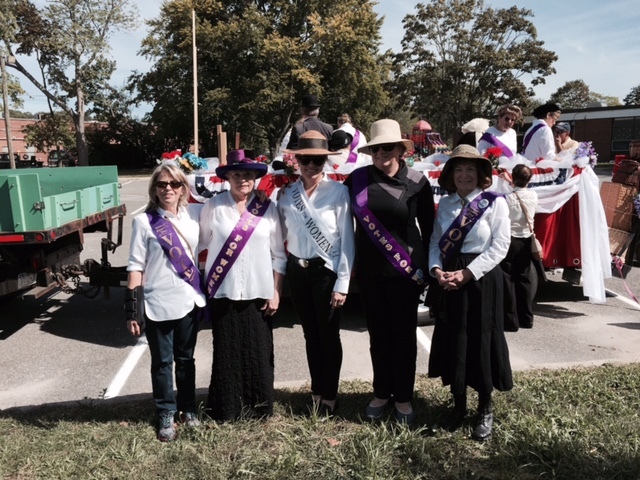 Under bright blue skies, graced by perfect crisp fall weather, thousands both paraded and watched the celebration of Smithtown’s 350th anniversary on Saturday, including representatives of the Long Island Woman Suffrage Association. 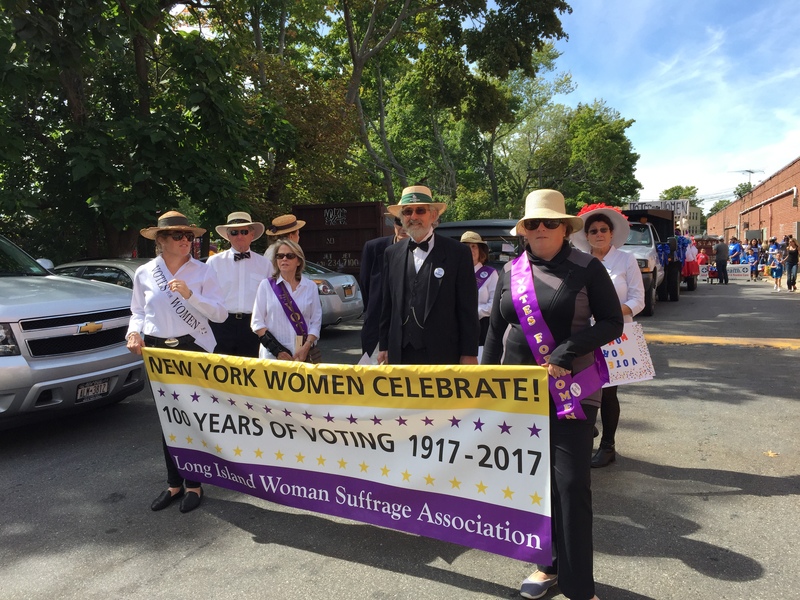 Along with the Lake Ronkonkoma Heritage Association, we proudly marched down Main Street, carrying our banner and spreading our message, reminding all to celebrate the upcoming centennial of women voting in NY State. The Lake Ronkonkoma Heritage Association joined us with two historic cars and a float carrying men and women in costume, all bearing the message of the importance of celebrating “votes for women.” Bystanders lining the parade route waved, clapped and cheered, shouting encouraging remarks, offering enthusiastic support for our message. “Yay for the women,” was heard over and over. Our thanks to all who came and marched with us, and we look forward to other celebrations. Pictured are some of our intrepid marchers waiting for the parade to begin. Please add The National Susan B. Anthony Museum and House, located in Rochester, N.Y., to the links you have listed on the side of your page. It is a wonderful national historic resource, and holds the official history of Anthony’s life and work. You should also be aware that her birthplace in Adams, Mass., which you do have listed, was unfortunately purchased by an anti-abortion group which promotes their point of view on the walls of the house!